Jingle Bell Rock Holiday Costume. 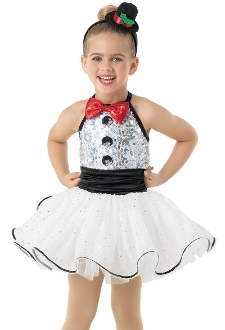 This holiday dress features a hologram sequin spandex bodice accented with three large, decorative buttons and a sequin bowtie. The halter strap has a G-hook closure at the neck with two straps in back. The attached skirt has a ruched stretch satin cummerbund and is made of curly hem foil dot mesh with sequin trim over tricot. Attached briefs. Glitter free! Made in USA. Includes Mini top hat headband. Available in Red or White in Child XS - XL.